The best skateboard bearings are among the most valuable parts of a skateboard. It is vital for your skateboard to have sensible bearings as they can keep the skateboard wheel running smoothly, thereby resulting in a smooth ride. It should be noted that each wheel of your skateboard needs two bearings, that’s why you really have to be careful with your choice. If choosing skateboard bearings is still somewhat a confusing process for you, then you can always seek the aid of a buyer’s guide such as this article to help you all throughout the selection process. With the aid of this article, the somewhat complicated task of choosing skateboard bearing will be much more manageable for you. 1 What are Skateboard Bearings? 3 What is it that Makes a Bearing Go Fast? 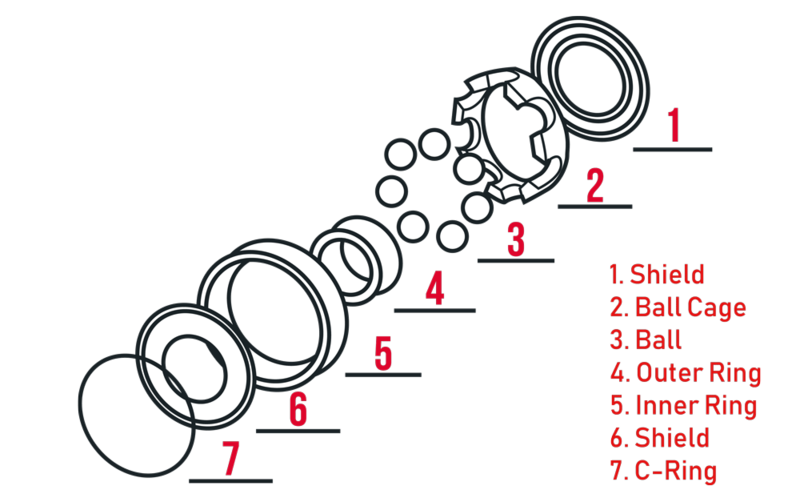 7 What are Spacers and Speed Rings? Skateboard bearings actually refer to the round metal pieces that you can find being fitted with the wheels of your skateboard. These are helpful in mounting the skateboard or longboard wheels into the axle. Regardless of the size of the wheel, all these bearings actually come at a similar size. You can also expect all of them to fit all wheels for skateboarding. 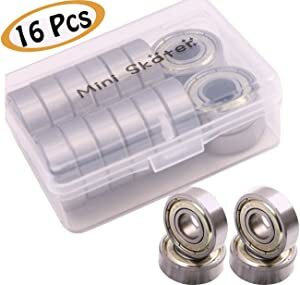 As for the skateboard bearings size, note that their universal measurements are usually 22 mm for the outer diameter, 7 mm for the width, and 8mm for the core. Most suppliers actually offer a set of bearings. They often sell bearings sets of 8 considering the fact that each wheel needs two bearings. You can also find them in various colors, letting you pick one that suits your style. Steel bearings are actually among the most popular ones you can find in the market. Many consider this material as one of the best skate bearings as it is known for being the industry standard in the field of skateboarding. If you pick this material, you will notice that the bearings are usually circular in shape. They also come with flat sides. 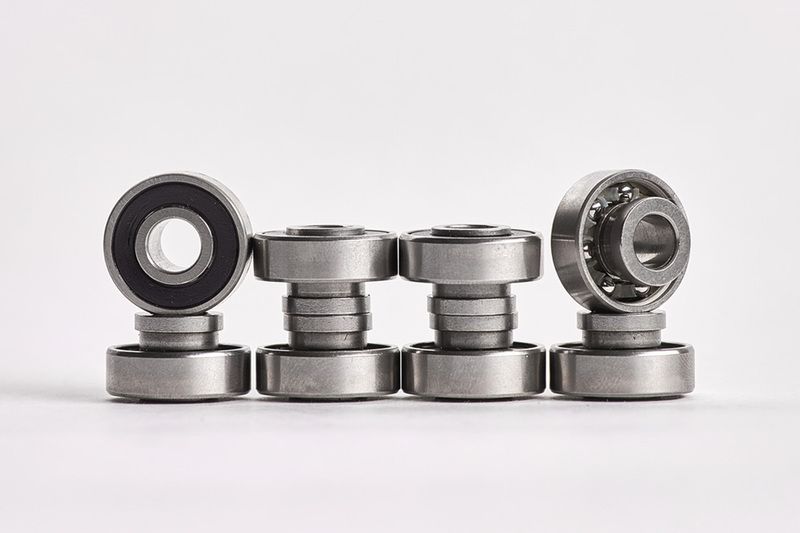 Each bearing houses around 7-8 lubricated balls designed to distribute a load’s weight and ease tension in between the skateboard’s axle and wheels. One major advantage of steel is that it is both durable and economical. However, there are also instances when the energy triggered by heavy friction in between the wheels and axle tends to heat up metal. The result is expanding or making the bearings less effective. That’s the reason why you really have to ensure that the steel bearings stay dry, lubricated, and clean, so they will work longer and more effectively. You can also go for ceramic skateboard bearings. Ceramic bearings are often constructed from silicon nitride, a compound. In comparison to steel, the material actually promotes a smoother ride while also being harder. Because of this, it is possible for ceramic to have reduced friction so there is less need to use a lubricant. It is less affected by heat energy, too. In case of friction, it has also been known that the ceramic material does not expand. That said, it won’t have a negative impact on the overall performance of the skateboard. The problem with this is that because of its high performance, it also comes at a higher price tag. Still, it is a good choice if you are willing to spend more for an excellent performance. You can also choose titanium bearings. While titanium is not as popular as the other two materials, you can still expect it to work well for skateboarding. In fact, this material is known for being smooth and light without having to sacrifice durability and speed. As far as speed and performance are concerned, the best option is probably the ceramic material. As mentioned earlier, it is smoother and harder than steel while also promoting a speedy ride. While it costs higher, the benefits of ceramic are definitely worth it. What is it that Makes a Bearing Go Fast? One thing that will help you determine how fast a bearing will be is the ABEC rating. You have to check this rating for a specific bearing if you want to make sure that you are getting a really fast one. Different skateboard bearing dimensions and sizes are also designed for different purposes. If you go for a bearing, which features an ABEC rating of 3, then note that it will be a bit slow. Go for one with a higher rating as it also aids in speeding it up. This means that the higher the bearing’s rating is, the faster it will be. If you want your skateboard to really move fast, then go for a bearing with an ABEC rating of around 7. Aside from that, you should also consider replacing smaller wheels with larger ones as they can also help your board move faster. 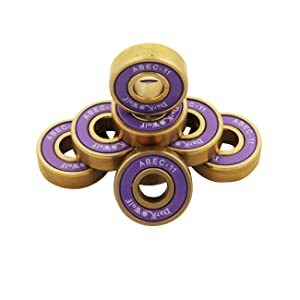 ABEC, which stands for Annular Bearing Engineering Committee, provides a rating for skateboard bearings, which indicates the performance and speed of the product. It should be noted that the ABEC rating serves as the industry’s standard in terms of determining the precision of ball bearings. ABEC 1 – Bearings with this rating are known for having the lowest precision level, which is the reason behind their really low price in the market. Several companies avoid selling those with this rating because there are those who view the items as having very low quality. Still, it is a good choice for skateboarding and is only a bit slower when compared to bearings with a much higher rating. ABEC 3 – Generally, these bearings skateboard are offered at an affordable price. The problem is that they do not roll as smoothly and as speedily as the higher-rated ones. ABEC 5 – This is considered as the standard rating for the majority of bearings used in skateboarding. It delivers a decent performance and speed at a reasonable cost. ABEC 7 – Often sold at a much higher price. It is mainly because the high ABEC rating also indicates a speedy and smooth performance. ABEC 9 – Those bearings with a rating of at least 9 are considered to be extremely fast. That said, expect them to be really ideal for downhill skating. It is a good choice for you if you are an advanced skater who really wants to move extremely fast. ABEC 11 and Up – There are companies who advertise this rating but it is still advisable for you to be wary in this case. It is because the highest rating considered for skateboarding is usually 9. You can also find other bearings rated by other organizations, like the ISO (International Standards Organization), German National Standards Organization, and the RBEC Anti-Fascist Bearing Manufacturers Association. However, the most popular ratings are definitely those from ABEC. The standard size of skateboard bearings is actually the size 608. It is considered to be the standard and original ball bearing. If you get the 608 series, you will notice that the ball bearing is typically composed of optional closures, outer and inner race, ball retainer, and balls. The size is also characterized by an inner diameter of 8mm, an outer diameter of 22mm, and a 7-mm width. They also reflect their own ABEC ratings as a means of measuring their manufacturing and dimensional tolerances. Bearings under the 608 series can actually be expected to fit all wheels designed for skateboards no matter what their diameters are. Aside from the size 608, you can also find other types and sizes of bearings, including the mini-bearings, roller bearings, and y-bearings. However, these are not often used in skateboards as the standard one is really the 608. If you choose the 608 bearing, then you will notice that the bearing balls tend to rotate in between two rings – the outer and inner ring. There is also a metal or rubber shield, which seals the whole unit. You can expect such bearing shields to be a big help in minimizing the entry of contaminants into the bearing, as well as the level of lubricant leakage. The shield of the bearing actually refers to a medium-sized ring, which you can find on its side. It is a vital component as it works in preventing dirt from penetrating the balls. The best skate bearings also often come with a rubber seal or shield. It can be defined as the soft rubber ring, which you can find at the outer part of the bearing. It is also important as it offers an aid in shielding the interior from debris and dirt. The ball cage, which is also otherwise referred to as the ball retainer, refers to that important component in the skateboard bearing that is used in separating the balls. It also helps maintain the symmetrical radial spacing of the balls. Another of its major function is to hold together the bearings. The ball cage is also essential as you can use it to provide lubrication. It is because it serves as a reservoir for oils. With the ability of the cage to hold individual bearings in their right places while still ensuring that the casing spins around them, it is indeed a specific part, which should always be present in your skateboard bearing. A skateboard bearing won’t also be complete without a set of balls. It could be a set composed of 6-7 ceramic or steel balls. These balls rest in the cage or retainer. The balls are probably the most essential components of a bearing considering the fact that they let the casing spin smoothly around them. The outer ring is also a vital component of the bearing. It refers to the round metal exterior, which is used in fitting all the other parts and components. This refers to the smaller metal ring, which you can find being fitted within the bearing’s outer ring. When sliding the wheel or bearing setup into the axles, you will need the inner ring as it is used in fitting the axles through. This specific component refers to the thin ring, which fits into a groove found on the outer part of the bearing. It is extremely useful as it works in locking the shields in their right places. What are Spacers and Speed Rings? Bearing spacers refer to the tiny metal cylinders that you can see being fitted into the wheel of the skateboard in between the bearings. They are vital in improving the performance of the bearing as they work in minimizing the weight that each one distributes. The results, therefore, include more stable and smoother turns. Bearing spacers are also necessary as they work in extending the life of your skateboard bearings. The good thing about these spacers is that they are inexpensive. You can also choose from the different materials used in making them, including aluminum and steel. Read more about “Why Bearing Spacers Really Matter” – Words by Nick Li – Stoked Team Rider at here. Speed washers, on the other hand, refer to the metal and thin washers slipped over the axle. You can find them in between the bearing and nut, as well as the bearing and hanger. Also called speed rings and bearing washers, you can expect these optional additions to your bearing to be extremely useful. One of its major functions is to minimize friction, which is a big help for the faster or speedier turning of the wheels. Note that low friction also translates to higher speed. In addition, the speed ring or speed washer also works as a buffer in between the bearing and nut. Such makes it possible for the wheels to rotate in a quicker manner while also ensuring that the face of the bearing is fully protected from damage. It should be noted that these speed rings are only optional additions to a skateboard bearing. However, many skateboarders and riders find it really necessary, which is the reason why they decide to install these additions to their bearings. It is actually an essential component, especially if you plan to ride your skateboard at a high speed. You have the option of replacing the speed rings as often as necessary. The frequency of replacement is actually dependent on how hard and how much you skate. When searching for the best skateboard bearings, you will surely come across plenty of brands that claim to be the best. Now the question is which one among them is really the best. This review article and buying guide, for instance, recommends plenty of brands, including Yellow Jacket, Spitfire, Heady Shake, Zealous, RollerBones, Amphetamine, Dark Wolf, NEAL Bearings, and Fireball Skate. All of them are reputable brands that receive lots of positive reviews from their buyers. However, one of the most prominent brands from them all is the Bones Bearings. This brand is popular for its various models of bearings, including the Bones Reds, Super Reds, and Bones Reds Ceramics. 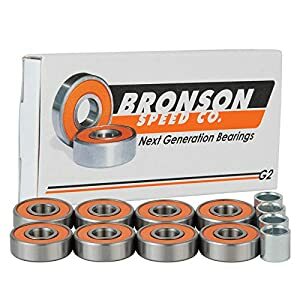 Searching for the most reliable bearings for your skateboard will also cause you to be introduced to the Bronson Speed Co. brand. Two of the most popular products from this brand are the Bronson G3 and the Bronson Speed Co. G2. 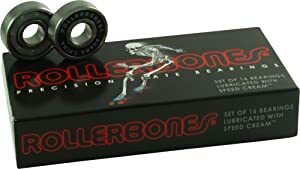 In your search for the most reliable skateboard bearings today, you will surely come across Bones Bearings Reds Bearings. Offered by the reputable brand, Bones Bearings, you will never go wrong choosing this product. It actually comes with a set composed of 8 bearings. It is also equipped with a logo sticker as well as instructions on how to set it up and use. One of the most favorable benefits of this product is that it promotes less friction and ease of cleaning. It is because of the single and non-contact rubber shield, which is also removable, integrated to it. Furthermore, it promotes a high level of speed and strength – thanks to the high-speed ball retainer made of nylon that it has. Note that this product also comes pre-lubricated using a speed cream racing lubricant. One downside, though, is that it does not feature a groove at the inner race, which is supposed to help the seal or shield develop a labyrinth. 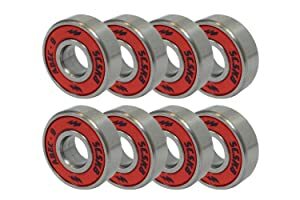 Another highly recommended skateboard bearing on the market today is the Bones Super Reds Bearings. It is also an 8-pc. bearing set. 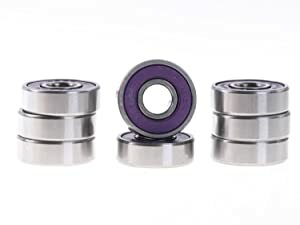 It is a great choice if you are in search of premium bearings considering the fact that they are equipped with high-quality steel races and balls. The bearings also boast of their superior surface finish. It guarantees a fast yet quiet and smooth ride. The fact that it has its own spacers and washers is also a big advantage as such features help in improving its ability to last a long time. It is because the spacers and washers can help the bearings withstand tough abuse. It makes use of a speed cream lubricant, too, which is a big help in promoting a sustained ride. It features removable rubber shields that make it easier for you to make the bearings clean. However, you will need to break it in by riding it for a few hours before you can finally enjoy its excellent performance. 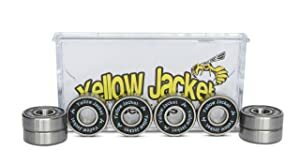 If you are looking for pro skateboard bearings, then you will never go wrong with the Yellow Jacket Premium Skateboard Bearings. It is a nice choice as it is known for its high speed and precision. It is also versatile that you can use it for skateboards and longboards, as well as roller blade, inline skate, and electric skateboards. Another nice benefit of this bearing from Yellow Jacket is that it is fully protected – thanks to the presence of engraved color seals. The seals are bright enough, making the bearings more attractive. In addition, they work well in protecting them from dust, rocks, and dirt, promoting a longer life and better precision. Another thing that you will surely like about Yellow Jacket Premium bearings is its minimal friction and high speed – that’s made possible with the high-speed racing lube used to lubricate it. One drawback is its tendency to produce noise when it’s working. If what you are looking for is a ceramic bearing, then it is also advisable for you to check out the Bones Ceramic Reds Bearings. What’s so nice about this product is that it is made of ceramic balls that are known to be not only harder and stronger but also lighter. In addition, ceramic is also long-lasting and waterproof. Cleaning it up is also easy. You will also like its minimal friction – that’s all thanks to the built-in non-contact and removable rubber shield. It is also a skate-rated bearing, which is an advantage as it indicates that it is capable of withstanding the harsh impact linked to hard landings and turns. It is an 8-pc. set, which gives you more than enough to handle your skateboard. The fact that it also comes pre-lubricated using a reliable speed cream racing lubricant also helps promote a smooth and fast ride. It is a bit pricey, though. 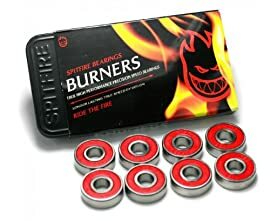 You will not also regret checking out the Spitfire Burner Bearings. What is so good about these bearings is that they are budget-friendly. Being offered at a really affordable cost, you will definitely realize how nice it is to invest in a bearing. Also, this bearing from Spitfire is known for being a great performer in the industry as far as speed and precision are concerned. It is mainly designed for skateboarding so you can definitely expect it to help you improve your ride. In addition, it is impact-resistant – thanks to the integrated removable nylon cages. Another nice quality of Spitfire Burner is that it is heat-resistant – that’s made possible with the high-carbon chromium steel rings that it has. It is also well-polished and is known for being able to last for a very long time. One possible problem that you might encounter with this bearing, though, is that you may find it too basic, especially if you are already an experienced skater. 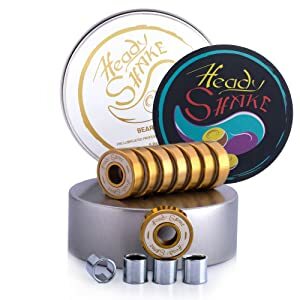 Heady Shake Pro Skateboard Bearings is also another recommended product for those who are looking for a fast and smooth ride. This model is known for its high level of precision – thanks to the well-thought out precision design. It can provide a quiet rotation as well as a high-spinning speed. You will also like the fact that it already comes pre-lubricated using a special lubricant as it also means that the bearings will work quickly and smoothly. It also works as one of the best longboard bearings. Furthermore, it is versatile that it also works for a roller skate, inline skates, kick scooters, and skateboards. Aside from boasting of its skate-friendly design, you will also love the fact that this set comes with eight high-quality bearings, a waterproof sticker, as well as four skateboard spacers. Furthermore, it provides a smooth rolling design while also instantly providing you with more control and stability than what a standard bearing can provide. It is slightly noisy, though, which is a minor downside. Another product that this buying guide will recommend is the Bronson G3 Bearings. Bronson G3 is actually available in a single set composed of eight bearings. It is really fast and smooth, so expect this model to be capable of providing your skateboard more edge when you’re riding it across the park or around the streets. A non-contact rubber seal is used to cover the bearings’ inner workings, thereby preventing dirt and dust from penetrating inside. A cage also holds the balls, which ensures that they stay in place when the bearings spin. It is a nylon-precision cage, which prevents the balls from spinning while giving them right spacing. It has an ABEC rating of 7 and comes at the industry standard 608 size. There are also 8 washers integrated into the set. In addition, the four spacers included are shrink-wrapped, thereby giving them protection. You have to spend time breaking it in, though, before you can fully enjoy its impressive performance. 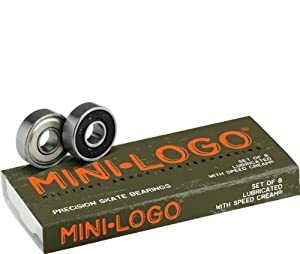 Finding the most suitable skateboard bearings for you will also most likely cause you to come across Mini-logo Skateboards Bearings. It is a precision 608 bearing, which is known for its consistent and excellent performance. It features removable shields for two sides – one of which is made of metal while the other is made of rubber. It also features a molded ball retainer, which is known for its speed. This skateboard bearing is also pre-lubricated using a speed cream, which is a big advantage as it means that it can reduce friction. Furthermore, it boasts of its hardened chromium steel balls and races with nice finish. The fact that it comes with shields on both sides is also beneficial as these protect the bearing from moisture, wetness, and dirt. You will also find it easy to clean and re-lubricate. It may not be suitable for advanced skaters who are planning to enjoy an extremely fast ride, though. Choosing longboard and skateboard bearings is also now made easier with the availability of Zealous Bearings. One favorable fact about this bearing is that it is equipped with speed rings and spacers. With these around, there is a lower risk for losing small parts in case you change wheels or bearings. It is also known for working with the least amount of friction. In addition, it boasts of its color-coordinated rubber seals that work well in keeping debris and dirt outside. Such works in making the bearing more durable. It also features 8-mm axles with holes that perfectly fit all types of skateboard trucks. It further results in a smooth and fast ride for all users. It makes use of a premium lubricant, too, which penetrates any flaws in the metal and smoothens them out, thereby speeding up the bearing. In comparison to Bones Reds Bearings, though, this product from Zealous is slower. You will not also regret checking out the Bones Roller Bones Bearings. They are known for being among the most precise skate bearings available in the market. What’s so good about these bearings from RollerBones is that they feature high-speed nylon ball cages that you can easily remove. It also features non-contact and removable rubber shield known for having less to zero friction. With that in mind, it can really give you the best ride possible. It also makes use of a low-viscosity speed cream for its lubrication. Since it is lubricated using a premium lubricant, you know that it promotes a smoother ride. It is also known for being long-lasting. In addition, you will love its speed as well as the fact that cleaning it up is a breeze. It does not have any rolling resistance, too. One problem, though, is that it does not work that quietly. It seems to produce a bit of noise. The Bronson Speed G2 is also another of the skateboard bearings from the brand that gained a lot of positive attention. It is popular for its top performance while also being offered at an inexpensive price. It has straight edge shields known for having no friction. The shields are also pop-off resistant, allowing it to hold oil in while keeping moisture out. It also boasts of its nano-ceramic compounds known for resisting corrosion. You can also expect it to prevent excessive wear. With all the features integrated into this product, it is possible for it to let you enjoy a smooth and long-lasting roll without having to spend too much. The balls can also be expected to roll deeper and sit in the raceway channels. It also works while reducing the possibility of damage and breakage due to angular or axial side impact. It takes a while to break it in, though. 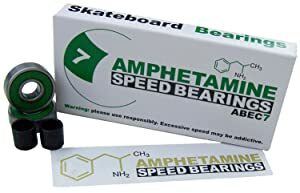 What is so impressive about the Amphetamine ABEC 7 Inline Skate Bearings is that they are designed in such a way that they can handle the demands often associated to skateboarding. It has a high ABEC rating, which is 7, proving that it is indeed one of the fastest bearings you can find today. It has eight balls, making the bearings faster and stronger since the impact will only be on two to three of the balls. In addition, it is pre-lubed using an extra-performance speed oil. You will also most likely love the gas-washed surfaces of this product since such help reduce friction. You will also enjoy the friction-free shields made of rubber integrated into the product. The shields work speedily while also being easy to clean and maintain. In addition, the balls included in the product are made of steel. The spacers that come in the package are quite challenging to line up, though. One thing that is so favorable about the Shake Junt Triple OG’s A-7 Skate Bearings is that they are guaranteed to give users with a consistently smooth ride regardless of where they decide to go. It is a single set composed of eight bearings, therefore, you’ll also have four wheels to connect to the ride. It has a high level of precision and tolerance considering the fact that it bears an ABEC 7 rating. The eight bearings that you can get from the set are also fully lubricated, which means that you do not have to do it yourself. It also features four spacers as well as a sticker. In addition, it is equipped with double-sided bearing ball shields that are useful in preventing dirt from penetrating within the bearing. One problem, though, is the initial inconvenience that comes with it being pre-oiled. Since it is pre-oiled, dirt tends to stick to it at first but you can solve that by using a cloth to wipe off any excess oil. 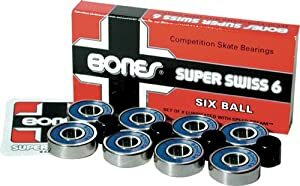 Another impressive product that’s worthwhile to check out is the Super Swiss 6 Competition Skate Bearings from Bones Bearings. One major benefit of this product is that it is capable of promoting a smooth, sustainable, and speedy ride. These Bones Super Swiss bearings also boast of their unique design. Such unique and innovative design features 6 large diameter balls, thereby resulting in a speedier acceleration, higher level of speed, and improved strength and durability. It also comes equipped with rubber shields that make it easier for you to clean it up. The nylon ball retainers included in the product also make the bearings speedier and sturdier. Aside from that, the brand makes use of a speed cream racing lubricant to pre-lubricate the bearings. It is also resilient when it comes to dealing with rust, heat, dirt, and dust. It also works well for inline speed skating. Note, however, that you may have to spend a couple of days to finally break it in completely. 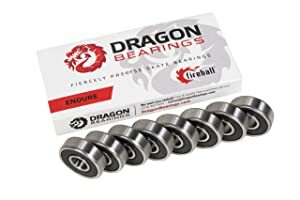 One of the major advantages of Fireball Dragon Precision Bearings is that they are specifically crafted and designed with the aid of professional and expert bearing designers. With that, expect these bearings to be fiercely precise while also delivering a high-caliber performance. 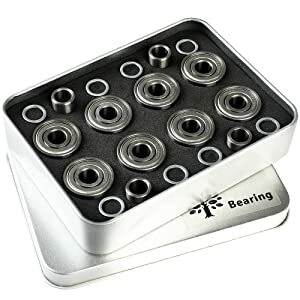 Some of the features that make these bearings really tough, sturdy, and precise are the highly precise steel machining, removable cages and shields, and dual labyrinth bearing shields. The bearings also gained great reviews for being long-lasting while also using premium lubricants. The dual labyrinth shields integrated into the bearings are also beneficial as they offer a high level of protection against the elements. That said, there is no need for you to think about the bearings getting dirty. It comes at a standard size of 608, making it suitable for use on skateboards, longboards, spinners, roller blades, roller skates, scooters, penny boards, as well as suitcases. The problem is that it is initially slow but you just have to break it in to make it roll smoothly and effortlessly. Buying the Bones Original Swiss Competition Skate Bearings will let you get a hold of a single set composed of 8 chromium wheel bearings. The set also features instructions, a nice sticker, and 4 bearing spacers. 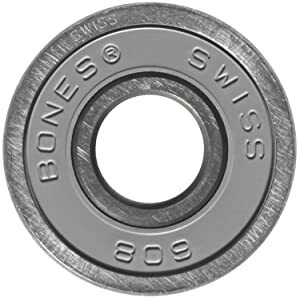 You will definitely love these Bones Swiss Bearings as they boast of their precision-grade and innovative Swiss design. One of the things that makes the Swiss Competition different from the other Swiss bearings from Bones is that its balls are polished using chromium steel. It is also equipped with one removable and non-contact rubber shield, which gives you a guarantee that the bearings are low in terms of friction while also being easy to clean. In addition, the bearings feature a nylon ball retainer, which is known to not only improve speed but also increase the strength. The result is a smoother and more sustainable ride. It is also skate rated, which serves as a proof that it performs better than the others. It tends to produce a rattling sound, though, but rest assured that it is manageable. Bones Swiss Ceramics Bearings won’t also disappoint in terms of speed, durability, strength, and smoothness of the ride. It comes at a single pack of 8 Swiss ceramic bearings. The set is also composed of a nice and attractive sticker, a set of instructions, as well as 4 bearing spacers. It has Cerbec balls ceramic bearings that are known to be strong and hard while still being light enough that you won’t experience any inconvenience using it. What is so good about these ceramic balls is that aside from being non-corrosive and lightweight, they are also long-lasting and have low rolling friction. With that, expect the bearings to have a faster acceleration. You can also expect them to roll farther. It has a high resistance to dirt and moisture while also being easy to clean. Bones Ceramics Bearings are not ideal for beginners, though. If you are a beginner, then you might find the Bones Super Reds more useful. It is also advisable to check out RaZr Precision Bearings ABEC 7 Pro Skateboard Bearings. It is rated with ABEC 7, which showcases how tolerant and great-performing it is. It is known for its high-precision machining. It works well for advanced skaters – thanks to its dependable lighting speed spin. Such can be expected because of the non-contact deep groove and the specially lubricated bearings. It makes use of the SpinX lubrication oil, which is actually a good thing as it evenly distributes heat fast. The well-balanced design of this bearing is also a great advantage as it promotes a smooth and efficient spin. The great performance of the bearings is one of the reasons why many consider it as one of the best gift ideas for someone who loves skateboarding. You will also instantly notice its versatility as you can use it in different applications, including longboard, inline, roller skates, kick scooter, and skateboard. However, because of its speed, it is more compatible for advanced users than beginners. 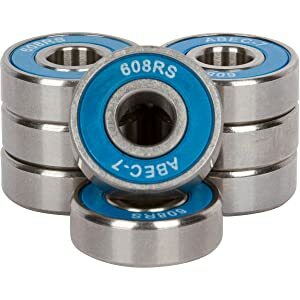 Another remarkable product that’s worth checking out if you are looking for a dependable and high-quality skateboard bearing is the Voform Pro Skateboard Bearings 608. One major highlight of this bearing its high speed and precision. It is also specially designed for skateboards, electric skateboards, inline skates, and longboards. Since it is specifically tailored for the needs of skateboarders, like you, expect it to help give you a smooth and unforgettable riding experience. That’s possible while ensuring that it performs its function with low noise. This set actually consists of 8 bearings, 8 washers, and 4 spacers. It is of top-notch quality considering the fact that it underwent a hundred percent dimensional testing. With its engraved color seal, you also have an assurance that the bearings will be protected from harmful elements, like rocks, dust, and dirt. The durability of this product still has to be tested, though, since it is still quite new. Specially manufactured for skateboards, electric skateboards, etc. 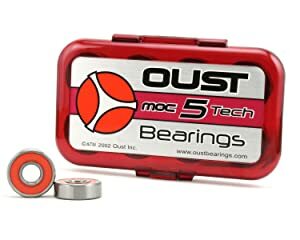 One of the things that you will notice right away about the Oust Bearings MOC 5 Tech is its highly distinctive bearing design. Such design is so unique that it can handle tighter tolerances well. 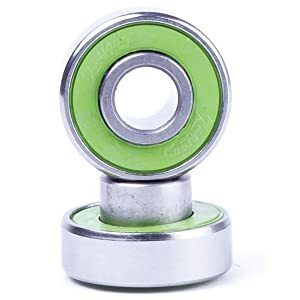 What’s even more impressive about this bearing is that it is mainly designed to deliver a high level of endurance for use on technical skateboarding. It makes use of a carbon steel ball cage, which is helpful in maximizing the strength of the bearings. This cage guarantees that the balls will be placed on their rightful places even when dealing with harsh environmental conditions. It also promotes a high level of speed, durability and performance as well as low friction – that’s thanks to its high Rockwell material hardness. It also features two removable rubber seals designed to deliver superior protection for the bearing. The bearings are also pre-lubricated with the aid of ME-TOL synthetic speed oil. It is a bit slow at first but waiting for it to be fully broken in will definitely help you notice its speed after a while. With the NEAL Precision Skate Bearings, skateboarding will also become a more enjoyable and exciting experience for you. 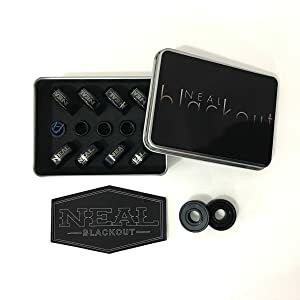 Investing in these precision skate bearings from NEAL will definitely let you reach your destination at the smoothest and fastest manner possible. It is known for working really quick. In addition, it makes use of ceramic, which is popular for being around forty percent stronger and fifty percent lighter when compared to steel. Another thing that’s so impressive is that it is finely balanced. Expect it to give you a high spin rating, which is up to a hundred thousand rpm under each load. It is known for giving your skateboard, longboard, or any other board you are using with a longer and smoother rolling. You will also love the inclusions in the set, including its 8 precision bearings, a waterproof sticker, 4 skateboard spacers, and an aluminum case. It tends to squeak after a while of use, though, but rest assured that it’s only a minor inconvenience. 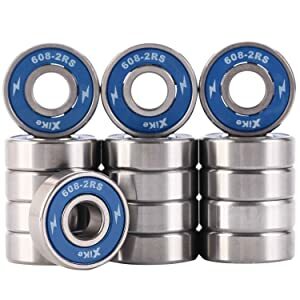 With its ABEC 9 rating, one can instantly confirm that the Mini Skater Precision 608 ZZ Bearings are among the most precise skateboard bearings available in the market at present. It makes use of chrome steel material, which is a big advantage as it is known to be not only durable but also resistant to possible deformities caused by heavy loads. It guarantees a fast and smooth roll and ride at a reasonable price. This bearing actually has an 8-mm inner diameter and a 22-mm outer diameter, which makes it convenient to use. Since it is already pre-lubricated, you will be able to use it right away. The lube used is also known for improving the durability of the bearings while also making them perform well. 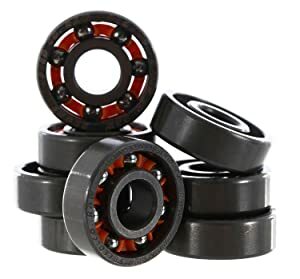 One more impressive thing about these bearings is that they are flexible and high in quality in the sense that you can expect them to be compatible with all kinds of longboards and skateboards. However, it is not as durable as other high-priced bearings sold in the market. With the ABEC 11 rating of Dark Wolf Skateboard Bearing, you know that its level of precision is really high. This bearing is actually constructed from titanium electroplating process. There is also a sturdy chrome steel material integrated into it. The good thing about the materials used in this bearing is that they are known to be not only stable and durable but also resistant to corrosion and wear and tear. It is also dust-proof, so expect it to gain protection from dust and dirt. It perfectly fits well for skateboarders, like you. Another advantage of these skateboard bearings from Dark Wolf is that they are also equipped with high-quality spacers and washers. There are actually four spacers and 8 washers included in the set. It also boasts of its good anti-swelling property. It is not totally quiet, though, but rest assured that when you are riding it, its noise is quite unnoticeable. SCSK8 ABEC 9 Bearings is also a nice choice for anyone who is in search of a good set of bearings for their skateboard or longboard. This product is one set composed of eight bearings. Made of pre-lubricated steel, you know that it can handle the ins and outs of skateboarding. SCSK8 ABEC 9 Bearings also boasts of its rubber seal known for its element protection 608 RS feature. Such offers it with a high level of protection against the elements while also showcasing a low level of restriction. Aside from being used in skateboards and longboards, some people also use it for pro-boards and carts, showing its versatility. The lube used in lubricating the bearings is also known to be an excellent performer in the industry. It is durable while also helping the bearings deliver a smooth ride. The fact that it is really affordable is also a bonus. However, note that it is not as sturdy and as long-lasting as the bearings that cost more. Bronson Speed Co. also continues to impress skateboarding enthusiasts with its RAW Skateboard Bearings. Just like most of the bearings indicated in this article, it is a set composed of eight high-quality bearings. It also comes at the standard size of the industry, which is 608. In addition, it lets you experience a quick and smooth ride considering the fact that it is pre-lubricated. It also boasts of its deep groove raceways, allowing the balls to roll deeper and sit well on raceway channels. It is equipped with micro grooves, too, designed to increase spin through the elimination of the lubricant’s standing wave. Furthermore, it features a ball cage socket, which is engineered to hold oil in place. That said, expect the ball to receive continuous lubrication. It is smooth and light while also containing additives designed to resist moisture, oxidation, corrosion, and rust. It is priced higher than the other skateboard bearings with the same quality, though. If you are a casual skateboarder who wants to have fun and enjoy a fast and smooth ride in the park or any other location, then the Radeckal Blue ABEC 7 Skateboard Bearings is definitely a nice option for you. You will never be disappointed with the quality and speed of these bearings. It has an ABEC 7 rating, showcasing its high precision grade. It also promotes a smoother glide and boasts of the fact that it is skater tested. In addition, it is lubricated with a high-grade oil, making it really work in the park and in any other place you decide to skateboard. Overall, its construction is also durable and of high quality. It is compatible with numerous applications, including longboards, skateboards, rollerblades, inline skates, cruisers, and roller skates. The fact that it is not as expensive as the others is also a big advantage. However, some users say that the performance of the more expensive Bones Reds Skateboard Bearings are much better. Another of the bestselling skateboard bearings today is the 16-pack 608-2RS Skateboard Bearings from XiKe. It is professionally made and specifically designed to meet the needs of those who love skateboarding. It works smoothly while also known for its really long life. You can also expect the bearings to work with the least amount of noise, making it really convenient to use. It underwent a hundred percent dimensional testing, which proves that its quality is unquestionable. The fact that it features a seal is also a big help in preventing impurities from penetrating inside. With the seal, disassembling and cleaning up the bearings is also much easier. It is also equipped with a nylon retainer, which is enhanced in such a way that it is not prone to damage. It does not have grease, too, because only a tiny amount of lube is applied. One problem, though, is that the bearings don’t spin just as well as the other models. If excellent precision is what you are after, then you can never go wrong with Mini Skater 16-pc. Silver Generic 608 ABEC 9 Precision Skate Ball Bearing. It is a set composed of 16 bearings, giving you a lot of extras for your longboard and skateboard. It is available at the standard 608 size. A speed lubricant is also used in pre-lubricating it. Such lube is known for boosting the durability of the bearings while also enhancing their performance. It works well with all kinds of longboards and skateboards. You will also notice how solid and sturdy the bearings are right after you take a hold of them. 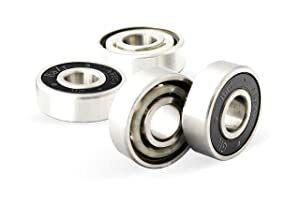 One more thing that you will surely love about these bearings is that they roll and spin smoothly while also boasting of their high level of speed. In addition, you will find the bearings useful for numerous applications. One problem is that the product seems to have a lot of grease at first but you can just wipe it off for your convenience. Reds and Super Reds are two of the most popular products from Bones. However, take note that they are not the same. You will notice a few differences between them. One major difference is the price. It is because Bones Reds are known to be cheaper than the Super Reds. As to performance, many say that Bones Super Reds are much better probably because they are priced higher, therefore, they underwent a more stringent manufacturing process. 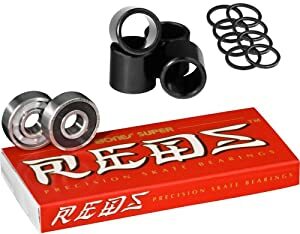 Super Reds Skateboard Bearings are also quieter and tend to roll smoother than the Bones Reds. In addition, Super Reds require less cleaning and maintenance. Other Bones bearings that are worthwhile to compare are the Bones Swiss Ceramics and the Ceramic Super Reds. One way to distinguish the two is on the price as Bones Ceramic Super Reds is sold at a much higher price than the Swiss Ceramics. It should also be noted that the Ceramic Super Reds from Bones are considered to be lighter than Bones Swiss Ceramics Bearings. In addition, they offer quicker acceleration because of their balls that tend to weigh less. One more difference is that the Ceramic Super Reds produces less friction, making it faster when compared to the Swiss Ceramic. Bronson G3, Bones Swiss, and Bronson Raw are also among the most reliable skateboard bearings you can find today. If you are torn between these products, then learning about their individual features is the best thing you can do to choose. As for Bronson G3, take note that one of its best qualities is its ability to roll farther while also resisting impact better than other bearings today. Bones Swiss, on the other hand, boasts of its smoother and faster performance while also being known as longer lasting when compared to the others. However, they also tend to be priced higher than the other two. As for Bronson Raw, it is designed to provide users with the strongest, fastest, and longest spin. It is also known for being the only shield-less bearing tailored for skateboarding. Another brand that you can compare with Bones Reds is the Shake Junt. Both actually have almost the same prices for their products but the performance differs. Some say that most of the bearings offered by Shake Junt are built with speed in mind. That said, expect them to be really fast and smooth. You can also expect them to work well for big drops. Bones Reds, on the other hand, are preferred by many because the brand has been around for years already. You should consider getting the Bones Reds, especially if you are after enjoying a long-lasting and quick roll and spin. If you have a limited budget but would like to own a bearing with almost the same quality and performance as Bones Reds, then Zealous Bearings is probably your best choice. With that in mind, the major difference between these two products is the price as Zealous is cheaper than Reds. What’s even better about Zealous is that they are also equipped with speed rings and spacers, making everything easier for you. Bones Reds, however, seem to spin longer when compared to Zealous. Also, there are some differences on sounds considering the fact that Reds is quieter than the other. In terms of price, Mini Logo is considered to be the apparent winner if you compare it with Bones Reds. It is because of its much lower price. It also moves, spins, and rolls fast. The problem is that such performance is not as good as the one portrayed by Bones Reds. Bones Reds is known to be really superior in terms of performance and speed. Also, it has a solid built, making it last longer than the others, particularly Mini Logo. Another major difference is that it is much easier to clean and maintain Bones Reds than Mini Logos. Bearing Removal Tools – These tools are mainly designed to help you dismount the bearings from their housings with ease. You need to remove them just in case you need to clean it up or give it its regular maintenance routine. The best bearing removal tools that you can invest in for your maintenance and cleaning unit is the Alouette Skate Tool Set. Bearing Cleaner Kit – Of course, you also need a cleaner kit, which you can use to clean up the bearing. Remember that your skateboard bearings require regular cleaning to ensure that they continue to deliver their optimum performance. Regular cleaning is also the key to making it last for a long time. Among the best bearing cleaner kits that you can buy today is the Bones Skate Bearings Cleaning Unit. Bearing Oil/Lube – Proper bearing maintenance is also possible if you have reliable bearing oil or lube around, including the Bones Speed Cream Skate Bearing Lubricant and the Ardent Reel Butter Bearing Lube. Using the lubricant will ensure that the bearing will continue to perform well even when dealing with the most demanding conditions. It also has a positive impact on the speed, life, noise, and torque of the bearing. The bearings are indeed among the essential skate accessories or components for your board. That’s the main reason why you really have to choose wisely. Note that the best skateboard bearings are those that work in eliminating friction that might affect the spot in between the metal, which you can find within each wheel as well as the metal axle where you can expect it to spin around. Considering the many options available in this industry, you have to study everything that you need to know about these products. That way, you will be a more informed and knowledgeable buyer, allowing you to sort out all your options and pick out the one, which really suits your needs the most. LaderaSkateboards.com is a participant in the Amazon Services LLC Associates Program, an affiliate advertising program designed to provide a means for sites to earn advertising fees by advertising and linking to Amazon.com. Amazon, the Amazon logo, AmazonSupply, and the AmazonSupply logo are trademarks of Amazon.com, Inc. or its affiliates. Additionally, LaderaSkateboards.com participates in various other affiliate programs, and we sometimes get a commission through purchases made through our links. We do not specifically market to children under 13. Copyright © 2018 · Ladera Skateboards, All Rights Reserved.